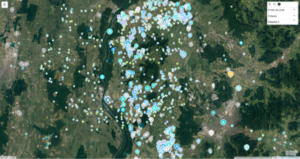 ArkeoGIS was developed to pool archaeological and environmental data about the Rhine Valley. It is now a multilingual, free and online GIS (available in German, English, Spanish and French). Currently in its fourth version, ArkeoGIS allows the users to pool spatialized scientific data about the past. The databases come from different sources: institutional researchers’ work (either personal or contractual researches), graduate students’ researches, private companies and archaeological heritage management services. They also come from palaeoenvironementalists’, geographers’ and historians’ work. All these databases are available and can be queried online. Every user can query online all or only a part of these databases, display the results on multiple backgrounds maps and export them towards other tools he might use. ArkeoGIS’ chronological frame has now extended and allows researchers to aggregate data from the Prehistory to the XXIst century. Spatially, the whole world is covered. Nowadays, the best documented areas in ArkeoGIS are the Rhine Valley, the Mediterranean East and the Middle East. ArkeoGIS wird von Huma-NUM gehostet und ist eine dauerhafte Lösung (Handle in NAKALA). die Universität Strasbourg, MISHA, INTERREG, LABEXMED und IDEX - Investitionen für die Zukunft.